Titanium is a chemical element with the symbol Ti having atom number 22. It is fair to say the element was discovered twice, in 1791 by William Gregor in the mineral ilmenite and a few years later (1795) by Martin Heinrich Klaproth in rutile ore. The latter named it “Titanium” after the Titans in Greek mythology. The fact that titanium is highly reactive with oxygen and carbon at high temperatures complicates the production of pure titanium. Anton Eduard van Arkel was the first person to produce pure, metallic titanium in 1922. (It should be noted that about 95% of the total titanium volume produced is being processed into TiO2 (titanium dioxide), which has paint, plastic and paper as end use applications. However, these applications are beyond the scope of this article). Aerospace (airframes, landing gear, rockets, etc.). In aerospace, strength-to-weight ratio is very important, also factors like fatigue resistance, fracture toughness and machinability need to be factored in when choosing the material for a specific application. For applications in aircraft engines, the resistance against temperature fluctuations is another welcome property. Medical applications: prostheses, implants, surgical instruments, dental applications. The biological inertness, combined with the high strength to weight ratio have made titanium a prime candidate for these applications. Products needing to be strong yet light: bicycles, golf clubs, spectacles, etc. High strength, combined with non-allergic properties make titanium a suitable candidate for these applications. Maritime applications. The maritime environment is highly corrosive. Due to the high corrosion resistance titanium is a prime candidate for maritime application, like propellors. Jewelry. Titanium can be used in jewelry because it is non-allergic, biologically inert and can be machined and molded easily. The mining process of titanium is rather straightforward: the sands (containing a mix of minerals: rutile, ilmenite, leucoxene and zircon) are either strip mined or dredged. Physical methods, like gravity separation spirals and magnets, are employed to separate the different minerals. The titanium dioxide (TiO2) content of rutile is being processed chemically into titanium tetrachloride (TiCl4), a key input for the titanium metal industry. Ilmenite must be upgraded into titanium slag (as being done in Russia, the Ukraine and Kazakhstan), or it must be converted into synthetic rutile (all other countries). The latter can be done using either the Becher or the Benilite process. Synthetic rutile is being produced in seven locations worldwide, with the lion’s share of capacity in located in Western Australia. 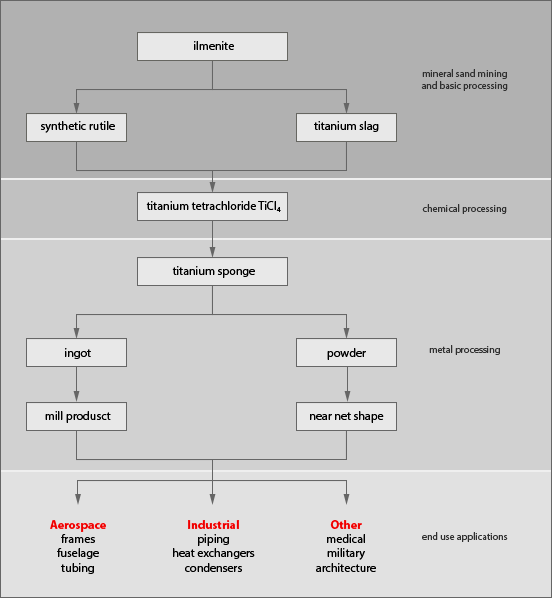 Titanium metal uses the Kroll process to produce titanium as an intermediate product. Since it takes several days to convert a batch of TiCl4 into titanium sponge (to be physically removed from the reaction vessel) this is a costly process. The titanium sponge is subsequently melted into a titanium ingot. The ingot is being worked into mill products (such as sheet, bar, wire, tube and forgings). This process tends to produce around 40% scrap, which is being remelted into ingot. Scrap is also obtained from end users, especially in the case of aerospace applications. Reduce residual stresses developed during fabrication; this is called stress relieving. Optimize the balance between ductility, machinability, dimensional and structural stability; this is known as annealing. Increase strength by solution treating and aging. Optimize special mechanical properties such as fracture toughness, fatigue strength, and high-temperature creep strength. Titanium alloys are classified as α, near-α, α-β, or β alloys. Commercial β alloys are metastable, that is to say that when these alloys are exposed to selected elevated temperatures, the retained β phase decomposes, causing strengthening. β alloys allow combination of stress-relieving and aging, or annealing and solution treating, in one operation. Post heat treatment properties are influenced significantly by oxygen and iron content. Iron has an adverse effect on creep properties. Most creep-resistant alloys require iron levels at or below 0.05% by weight. Removal of residual stresses increases shape stability. Stress relieving may be omitted when machining symmetrical shapes in the annealed condition. This also applies when the manufacturing process can be adjusted using annealing or hardening as the stress relieving technique, for example annealing may relieve forging stresses prior to machining. Generally, improvement in one category goes at the expense of another property⁄properties. Mill annealing. General-purpose treatment given to all mill products. Duplex annealing. Improves creep resistance and fracture toughness by altering the shape, size and distribution of phases. Recrystallization annealing. The alloy is heated to the upper end of the α-β transition range, held for a while, and cooled very slowly. This treatment improves fracture toughness and is applied for fracture critical airframe components. β annealing. Similar to recrystallization annealing, improving fracture toughness, however being done slightly above the β transition. Having the risk of causing excessive grain growth, it is necessary to control process parameters within tight ranges. Therefore, the process is being replaced by recrystallization annealing. In addition to annealing, sizing, straightening or flattening may be needed in order to meet dimensional requirements. α-β and β alloys can be solution treated and aged in order to obtain the desired strength levels. The high-temperature β phase is unstable at lower temperatures, causing the response of titanium alloys to heat treatment. The treatment involves heating an α-β alloy to the solution treatment temperature, producing a higher ratio of β phase. This condition is maintained by quenching; subsequent aging causes decomposition of the unstable β phase which gives high strength. Solution treating involves heating to temperatures around the β transition point, the selected temperature being dependent upon alloy type and practical considerations. β alloys generally are supplied in the solution treated condition, needing only to be aged. Complete solutioning must by ensured by applying adequate soak times. Solution treatment of β alloys involves heating above the β transition point; due to the absence of a second phase rapid grain growth may occur. α-β alloys are being solution heat treated at the temperature suitable for obtaining the desired mechanical properties after aging. As the α⁄β ratio depends on this temperature, consequently the response to aging does vary with this ratio. Normally, temperatures 25 to 85°C below the β transus are used, giving high strength with adequate ductility. However, if high fracture toughness or increased stress corrosion are required, β annealing or β solution treating may be desirable (at the sacrifice of a loss in ductility). Usually, α-β alloys are heat treated below the β transus, giving the optimum balance of ductility, fracture toughness, creep and stress rupture properties.